FX Unit Yuki: The Brand-New PCE/TG16 Game! Way back in October 2016, I plunked down a little over 40 bucks to back a Kickstarter project for a newly-developed PC Engine/TurboGrafx-16 game titled The Henshin Engine, which at the time was slated for a March, 2017 release. Welp, in April of 2018, the game finally shipped, and with a newly-modified title of FX Unit Yuki: The Henshin Engine. I’ve been playing it since I received my copy, so let’s check it out! The premise of the game is pure fan service: Yuki is an avid gamer attending the Yellow Bee Academy. Her favorite game console is the FX Engine by JEC. During a trip to JEC headquarters, she happens upon a prototype FX Engine, which zaps her into superherodom, whereupon she is tasked with actually entering developmental video games to wipe out bugs. But the rival SG corporation has sent their own avatar, Geni, into these same games with the intent of sabotaging their competition. Yuki must explore a number of diverse game levels to stop the SG corporation from screwing up JEC’s new products. 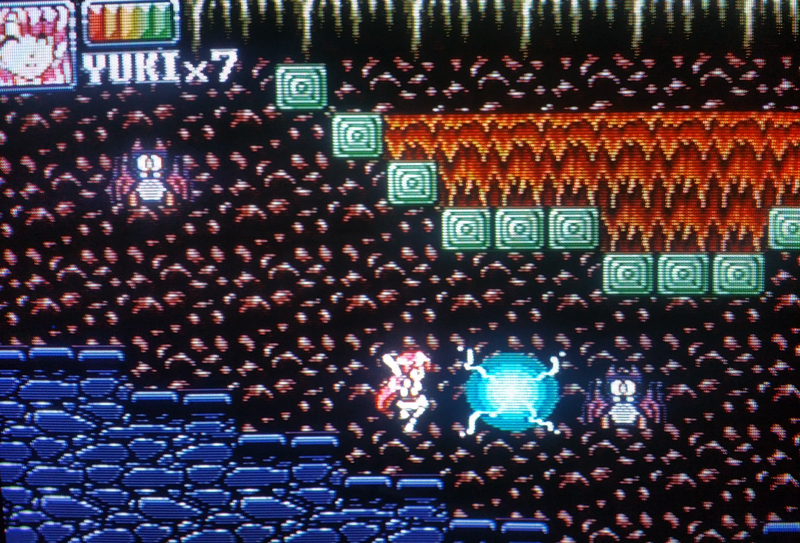 As such, each level in the game is a riff on actual popular PC Engine games. There’s an opening tutorial level, then the game’s first proper level is inspired by Adventure Island, followed by a a Cotton 100% parody. Dracula X gets a nod in the form of a “Castlevampire” stage, and Bonk/PC Genjin, Lords of Thunder, and Shockman/Shubibinman all get their own homages as well. 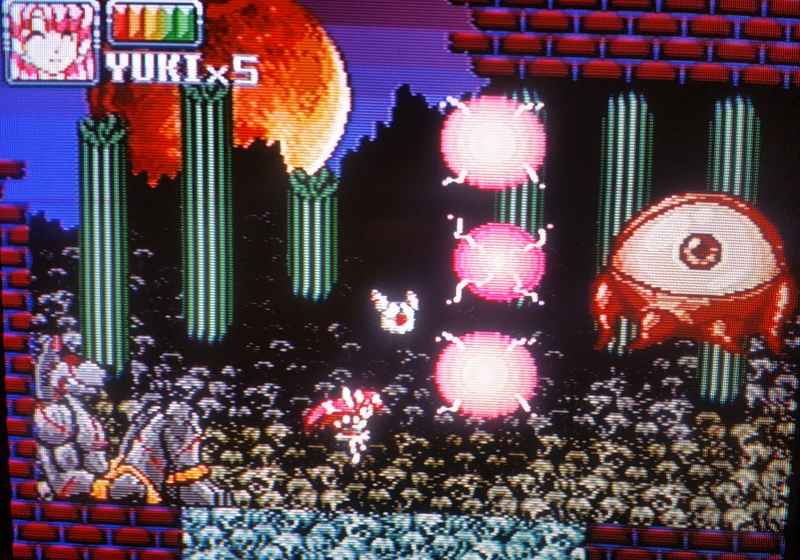 While most of the game is hack-n-slash platforming and jumping, the gameplay switches things up with a few shootemup levels adding some variety, and the Bonk-style level includes an underwater swimming scenario. 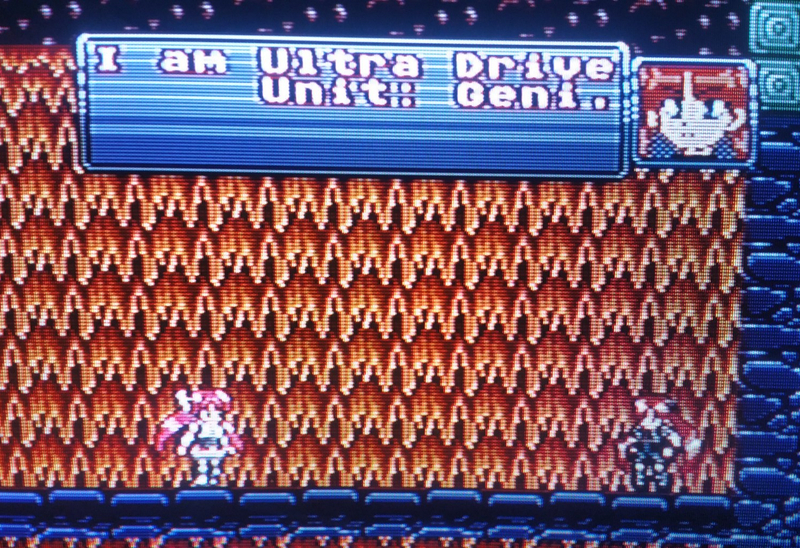 Full-screen, anime-style cutscenes in between levels really drive home the ’90s Super CD-ROM aesthetic. So how’s the game? 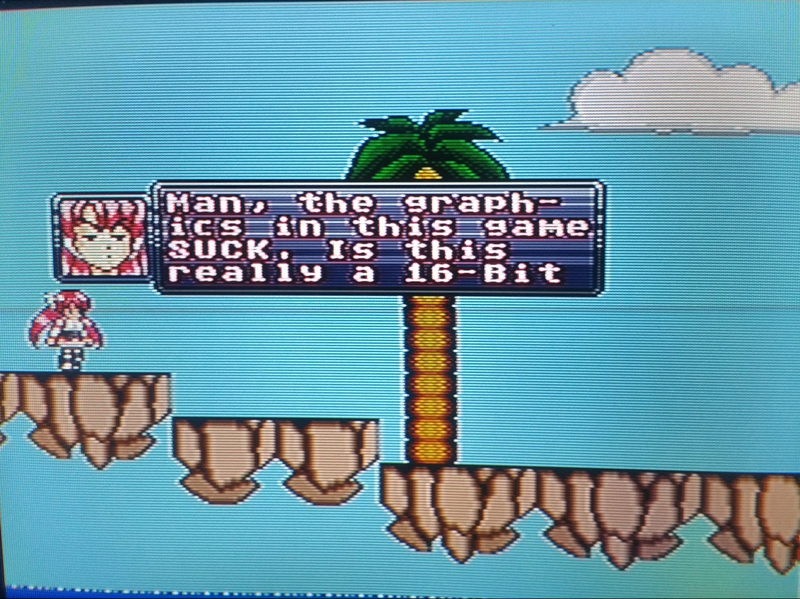 To start with, the graphics are wonderful. 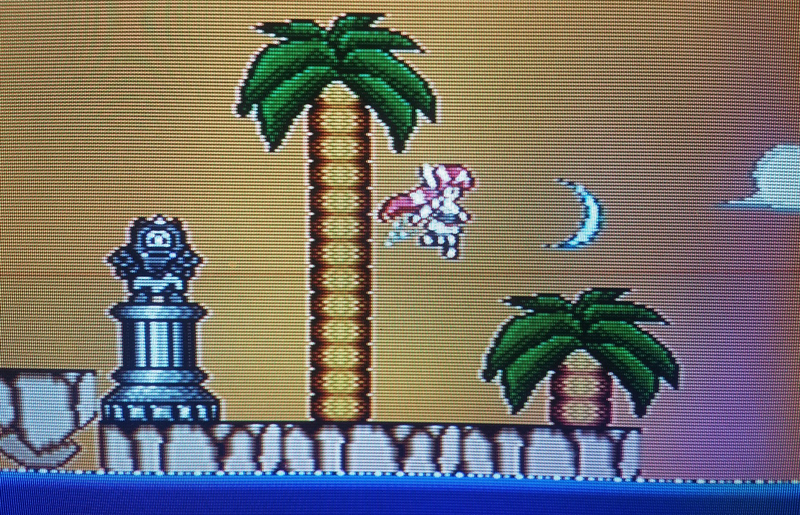 Yuki’s sprite looks great and does a lot with her animation, the way her hair waves in the breeze when she jumps and she strikes a pose when she finishes a level. Power-ups appear in the form of HuCards (of course! ), which give you new abilities. The backgrounds do a nice job imitating the styles of each game the levels are parodying without straight-up copying them; the same goes for a lot of the enemies, which are mostly of the cutesy variety, even in the Dracula level. The cutscene art is nicely done, and is remarkable in the fact that it’s displayed full-screen, as opposed to most PCE CD games of the day, which displayed cutscenes mostly in windows. In-game dialog pops up in windows with character portraits. There’s also a Yuki portrait in the upper left of the screen next to your health meter which changes expressions as your health depletes and/or regenerates, which is a nice little touch. If you’ve read anything else about FX Unit Yuki, you’ve probably noticed that the game’s music is getting a ton of praise; hard agree there, the praise is well-deserved! The soundtrack is awesome, with a mix of upbeat rock and videogame-y pop tracks, and absolutely holds its own amongst your favorite PC Engine OSTs. The control and gameplay feel good. Yuki handles well, and obtains all your favorite old-school attacks and moves: a sword slash, a charge shot, a slide, a double-jump. She’s very Yuko from Valis, which I’m guessing is intentional, but with a better jump. (Come to think of it, I said the same thing about The Master in my Actraiser article the other day.) Yuki also has a crouching punch attack with a very short reach, which I have yet to find useful, as her standing sword slash covers enough area to hit any low-riding enemies. The level design is mostly good, with lots of jumping challenges. There are a few odd platform layout choices here and there, and a couple levels that could be tightened up (the swimming area is kind of boring and the Lords of Thunder level drags on a bit too long, I think). 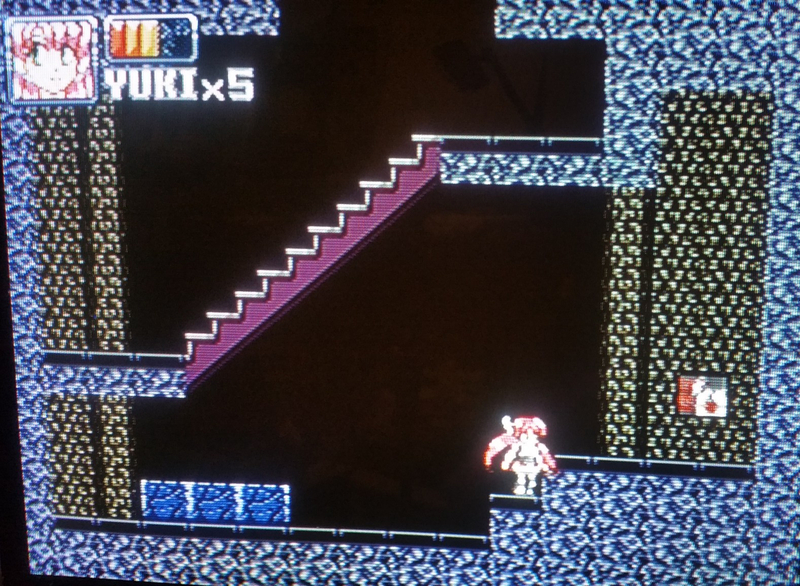 Levels that have stairs or ramps have a little bit of a bug, as Yuki doesn’t seem to run along a consistent path on them; sometimes she runs along the top of a stairway, sometimes her sprite is halfway inside it. Each level is broken up into fairly lengthy sections, and Yuki gets thrown back to the beginning of each section when she loses a life. It can get tedious, but at least it forces you to learn the game. Which brings us to the enemy behavior. Some of the enemy patterns are a little annoying, as many of the flying enemies (even in the intro stage) will zoom right past you and then whip around from behind, making them tough to hit head-on, and kind of breaking your flow. 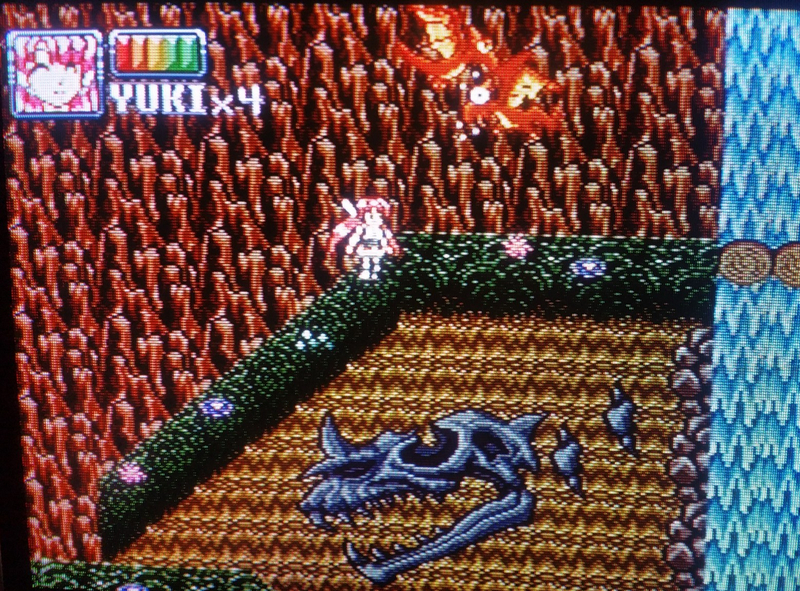 And if one of them hits you mid-jump, Yuki is knocked back at least a quarter of a screen, often to her demise in a bottomless pit or onto some one-hit-kill spikes, so you need to deal with them by memorizing where they’ll appear and hitting them immediately. 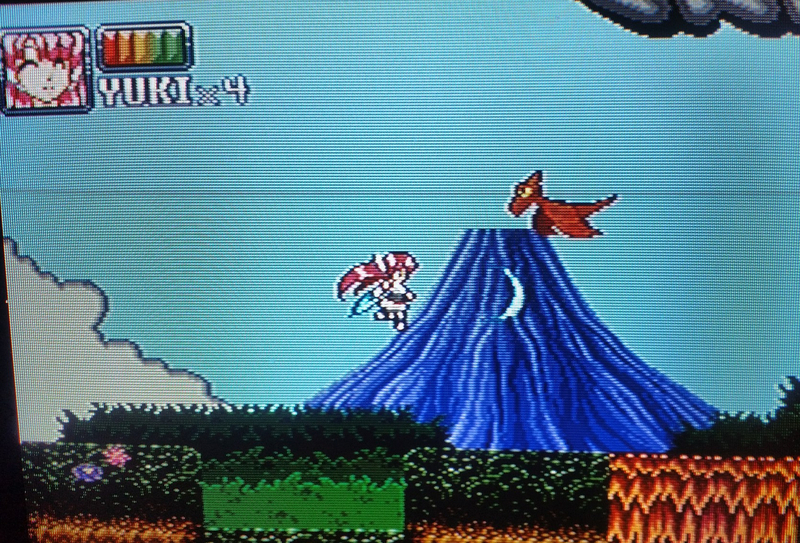 There’s a blue enemy in the first shmup stage that appears very quickly and leaps from the ground, hitting Yuki every time and he’s almost impossible to avoid. Bosses can be tough, and sometimes even a little cheap, but have mostly-learnable patterns and habits. Also, there’s a little mecha-pod enemy named Shir0 that joins you as a buddy in the story; he shows up in a few of the levels automatically, and I’ve found at least one stage where he’s hidden. I do wish there was a way to save your progress; I get that it’s old-school in that the game must be beaten in one sitting, but it’s a fairly lengthy experience; the only way I finished the game the first time was to play a couple levels, pause it and leave it on all day while I’m at work, play a couple levels, pause again for the night, and repeat until I finished. Once you learn your way through the game, it does go a bit more quickly. The game does save your difficulty setting, however. I beat it on Easy mode first (which is a bit breezier than Normal, and gives you more lives), and didn’t get the “true ending,” so a word to the easily-frustrated: start off playing on Normal. As such, I want to keep this post spoiler-free and not include too many late-game screenshots or give away any storyline or ending stuff. But is it FUN? Heck yeah it’s fun! FX Unit Yuki is just as fun and entertaining as many of the games it’s riffing on, and the challenge is welcome and not insurmountable by any means. Although I touched on a few minor issues above, I want to stress that this game is really as good as anything Hudson or NEC Avenue or Naxat put out back in the day. I keep going back to it not just because I want to beat it, but because I’m having a great time with it and it’s genuinely worthy of your gaming time. And before I wrap up, let’s talk about the package itself just a bit: it may be an independent release, but make no mistake, FX Unit Yuki is a not a homemade product! It comes with a profesionally-printed manual and artwork, a pro-duplicated full-color printed CD, and even a spine card. They also threw in a lanyard with Yuki’s JEC employee pass as a bonus! Higher-level Kickstarter backers got a “treasure box” package with even more goodies. Dreamcast and Genesis/Mega Drive editions were also discussed, although I have no idea where things are at for those platforms right now; I’m sure announcements will be forthcoming. The small team of developers, dubbed “SaruPro,” deserve all the respect for putting this game together. The fact that it shipped a year later than originally planned does not bother me at all; by this time, we’re used to delays from even triple-A-level developers, so a tiny group of indie devs putting this product out at all is remarkable. Yes, the game could still use a little fine-tuning here and there, but overall it’s an incredible effort and I hope to see more from SaruPro in the future as they join the ranks of indie-retro developers like NG.DEV.TEAM and HuCast. FX Unit Yuki is a very worthy addition to any PC Engine/TurboGrafx fan’s library that deserves its spot on the shelf next to Valis, Shockman, Bonk’s Adventure, and all the rest of the classics to which it pays tribute, and I’m very proud to have contributed to it — and to have my name in the credits! To learn more about FX Unit Yuki and order yourself a copy (which you should), visit fxunityuki.com.